Visit to Shwedagon Pagoda, the landmark of Yangon and one of the world's most spectacular religious monuments. It is said to be built over 2000 years ago enshrining the hair relics of Buddha. Continue to Chauk Htat Gyi, to see the huge reclining Buddha Image and then to gilded Sule Pagoda, over 2000 years old, and still stands as the landmark of Yangon City Center. Proceed to Bogyoke (Scott) Market where hundreds of stalls of souvenirs and handicraft shops can be visited. After Lunch, visit the National Museum to see the 8 meters high Golden Lion Throne and Mandalay Palace Royal Regalia, utensils, manuscripts, etc. In the evening, transfer to airport for evening flight to Bagan. On Arrival at Nyaung Oo airport, transfer to hotel. Dinner and overnight in Bagan. After breakfast, start excursion trip to Mount Popa, an extinct volcano of 1500 metres at the highest point Mount Popa and its environs are the only lush green place amidst the desert area of Middle Myanmar. Climb up the 730 metres high conic flattop (Named as Popa Taung Kalat) by 777 steep steps. It is the home of Myanmar's legendary 37 Nats or Spirits. You can see the panoramic view of the surrounding landscapes from the top of the Popa Taung Kalat. After lunch, visit the Popa National Park, with dense Sandalwood forests and rare species of birds and butterflies. Return trip to Bagan. On the way, visit to jaggery <palm sugar> making cottages and toddy palm grooves. Admire the sunset view of the Bagan Area from the uppermost terraces of the Shwesandaw Pagoda. Dinner and overnight in Bagan. After breakfast, start sightseeing trip in Bagan. First visit to Nyaung Oo Market where various kinds of local products and local people can be seen. Then visit to Shwesigon Pagoda, built by King Anawrahta in the early 11th century as the first Buddhist building built in Myanmar style. Continue to the ancient city of Bagan, which had been the Capital of First Myanmar Empire during 11th - 13th century. Over 2000 well - preserved pagodas and another 1000 ruined pagodas are scattering in the city area of 42 sq km. Visit to Ananda Temple, which has four huge Buddha Images in standing position and relieves depicting the Buddha from his birth to his Enlightenment. Next visit is to Thatbyinnyu Temple, the highest white stucco building in Bagan. After lunch, continues sightseeing the rest of Bagan. Visiting places include Dhamayangyi, Bagan's most massive temple; Shwesandaw Pagoda, with five terraces, built in 1057; Manuha Temple, from the 1059, in the Mon Style; and Nanpaya Temple, said to be the place of King Manuha's palace site. Also, visit the Lacquer ware workshops in Myinkaba village. Watch Sunset over the Ayeyarwaddy River from Bupaya Pagoda on the riverbank. After breakfast at hotel, transfer to Nyaung Oo airport for domestic flight to Mandalay. After arrival at Mandalay Airport, proceed to Amarapura, the former Royal City before Mandalay was born. Excursion to Mahagandayon Monastery to see the daily life of the Buddhist Monks. Visit 200 years old U Bein Teak Bridge, built in 1782, spanning the Taung Tha Man lake. Continued to Mandalay and check-in hotel. After lunch, start sightseeing in Mandalay. Excursion trip to Shwenandaw Kyaung (Golden Palace Monastery) a superb example of Myanmar traditional wooden building and Kuthodaw Pagoda, built by King Mindon in 1868, It also known as the World's Biggest Book for its 729 marble slabs engraved with Buddhist scriptures. Then drive the Mandalay Hill, 230 metres in elevation, for a panoramic view of the city and its surrounding areas at sunset. Dinner and overnight in Mandalay. 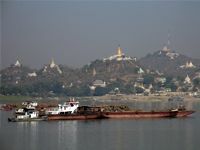 After breakfast, sightseeing trip to picturesque and peaceful Sagaing Hills across the Ayeyarwaddy River, covered with numerous pagodas and monasteries, and hence well known as a retreat for Buddhist devotees. Continue to Khaung Hmu Daw, huge dome-shaped pagoda, a copy of the Mahazedi Pagoda in Srilanka. On the return journey, visit the silver and pottery workshops at Ywa Htaung and Oo Bo villages. Lunch at a local restaurant and drive back to Mandalay. 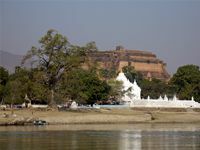 After lunch, a boat-trip on the Ayeyarwaddy River to Mingun about 11Km (1 hour) upriver from Mandalay. Visits to Mingun Bell, claimed to be the largest ringing bell in the world; Mya Thein Tan Pagoda, in memorial to the late Queen Sin Byu Me and the unfinished Mingun Temple, which could be the world's largest brick Pagoda if it was finished. Return to Mandalay. Dinner and overnight in Mandalay. After breakfast, transfer to Mandalay airport for domestic flight to Heho. On arrival, drive to Pindaya, approx, one and a half hours. Visit Pindaya Caves, unique for Thousands of Buddha images placed there by pilgrims over many centuries. Continued to Kalaw, a beautiful hill-station. Dinner and overnight in Kalaw. After early breakfast, start trekking tour to mountain villages where minority Palaung tribes lived. Enjoy the traditional meals together with the villagers. Return trip to Kalaw. 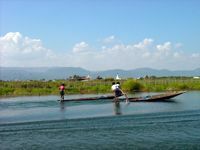 Transfer to Nyaung Shwe, a small town nearby the Inle lake. Dinner and overnight in Nyaung Shwe. After breakfast, sightseeing around the Lake including sights of typical leg rowers, floating gardens, local fishing, Phaung Daw Oo Pagoda, the most revered one on the lake, and the Nga Phe Chaung Monastery well known for its Jumping Cats. Lunch on the lake. After lunch, return trip to Nyaung Shwe. Continued to Taunggyi the capital city of Shan State by motor-road. Sightseeing in Taunggyi. Dinner and overnight in Taunggyi. After breakfast, transfer back to Heho airport for return flight to Yangon. On arrival at Yangon, start sightseeing in Yangon City. Visit to Shwedagon Pagoda, the landmark of Yangon and one of the world's most spectacular religious monuments. 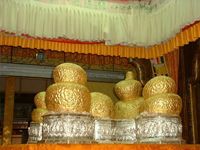 It is said to be built over 2000 years ago enshrining the hair relics of Buddha. Continue to Chauk Htat Gyi, to see the huge reclining Buddha Image and then to gilded Sule Pagoda, over 2000 years old, and still stands as the landmark of Yangon City Center. Proceed to Bogyoke (Scott) Market where hundreds of stalls of souvenirs and handicraft shops can be visited. 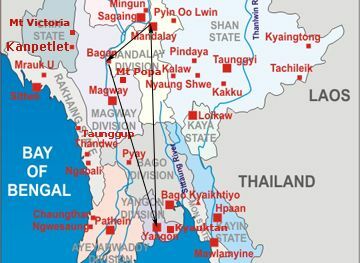 This 10 Day Tour Programme includes visits to places such as Yangon, the Capital City of Myanmar and the former Royal city of Mandalay, interesting cultural heritages of Bagan and Shan State, where life-style of minority mountain tribes can be observed.